Photo by Jean-Pierre Praderes for Jan Heine’s The Competition Bicycle. As the title plainly states, Jacquie Phelan is the Godmother. Or perhaps the Queen. At the very least, she’s one of mountain biking’s early pioneers and helped carved a path into the sport for women. 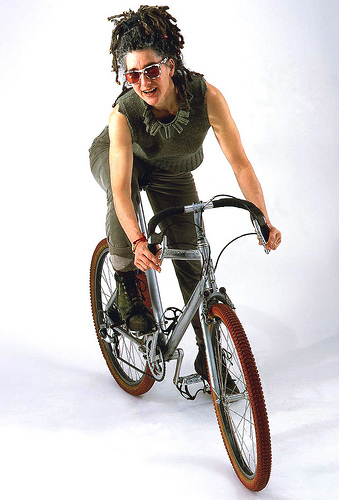 She helped found the National Off Road Bicycle Association along with other mountain bike luminaries of the day like Jack Ingram and her husband Charlie Cunningham; won NORBA championships and many other mountain bike races throughout the 80s and 90s; founded the first women’s mountain bike club and continues today to promote women’s mountain biking through it. Jacquie and I spoke about her introduction to mountain biking, her early days of racing in a “man’s” sport, the foundation of the WOMBATS and more. How (and when) did you first get into mountain biking? What were those early days of riding like? I was training on my road bike because the “ban” on women in Olympic cycling was suddenly lifted in 1981, and I decided since I get around on a bike, and since my friend Darryl Skrabak ‘commanded’ me to race, I went for it. Then, his friend Holland Jones took me up Mt. Tamalpais from the city one summer day in 1980 or so, on my road bike (up RR grade, a mellow 5-7% grade for the “crookedest railroad in the world”). It was incredible, riding about 20 paved urban miles across Golden Gate bridge from our foggy neighborhood, and emerging in sunny Mill Valley, climb Tam (bumpity-bump, with well-inflated tires…there were NO cyclists on RR grade then), then we flew down the pavement, Ridgecrest Blvd, and Panoramic. It was so exhilarating. I knew I was going to be doing a lot of these cool multi-surface rides. Holland’s a strange guy: he smokes cigarettes just to piss the other bikers off. He had a shop, Fulton St. Cyclery. If I’d won a certain grant at City College, (thank god I didn’t) I’d have blown the 1000 bucks on a custom made Jack Taylor bike at his shop. Jacquie (right) at the 1995 NORBA National Championship. What drew you to racing? 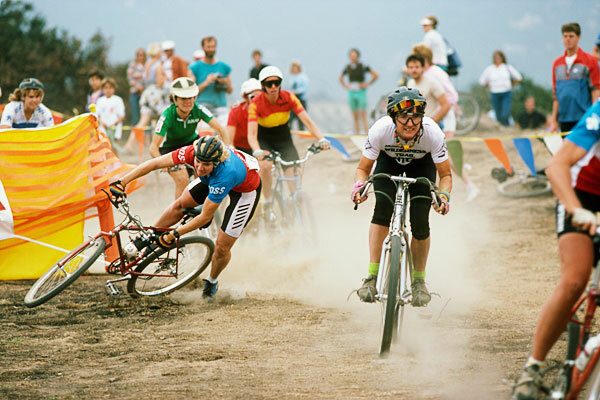 What was it like being a woman mountain bike racer in the 80s? Racing is a natural expression of narcissism. I’m hugely vain; I really do believe I’m “the best” (got a lot of hell for showing that, too). Maybe I was a bit premature in my self-proclaimed greatness, but I watched how the established top racers behaved, and decided I was not going to take the Snobbery Route. IF I ‘became great’ I’d talk to everyone, be nice, etc. Yah, that’s all in my battered biking journal. So I became a sort of honorary man, or had my own in-between gender, since ‘no woman could ride like that’ (amazing to hear that kind of sentence 30 years later, but there are still plenty of concrete ceilings around keeping the ladies down). I had a lot of feminist education when in college in France and was sure that the quickest way to improve women’s lot (i.e. the fact that vast legions of women were missing out on mud, blood, sweat, agony, exhilaration, camaraderie, the outdoors, fresh air, etc) was to create a warm atmosphere (instead of the chilly one I entered). Hence all the funny little tropes I introduced with my club the WOMBATS (women’s mtn bike & tea society, note the ampersand please)—tea, pearls, propriety. Because as some great feminist said a hundred years ago: in order to commit the most radical act one must dress the most conservatively. Hyperfeminizing the activities was de rigueur, as well as being the designated Slow Rider. In the late 80s, I don’t think there were any clubs that proudly announced that the leader would ride in the rear. How did the WOMBATS come about? Was it successful in getting more women to ride? Casey Patterson had a successful bike touring company called Wilderness Bicycle Tours. Mothers Day 1984 she organized a women’s tour since very few of her clients the previous two years were women. (They were usually amped-up, show-off yuppie guys out to prove themselves…which, when you put that together with a woman their mom’s age—welll.) Casey commissioned one of Charlie’s bikes—a really little model called Little Peoples Bike (later changed to The Wombat)—to help her keep ahead of her clients. Anyway, for Mothers Day we got 14 women together (bear in mind that there were only three women at the National Championship five months earlier) and it gelled. I decided women needed to ride together away from the guys, just so they could relax about gender role stuff. Yes, that was an issue then, and of course it still is, otherwise the Olympics would have 50 percent women athletes and the Fortune 500 would have 250 women. But no, it’s totally skewed, and will remain that way until we abolish capitalism. There, I said it. Can I scare away your readers? I don’t think democracy and capitalism can fit together since the first assumes parity, and the second presumes primacy. 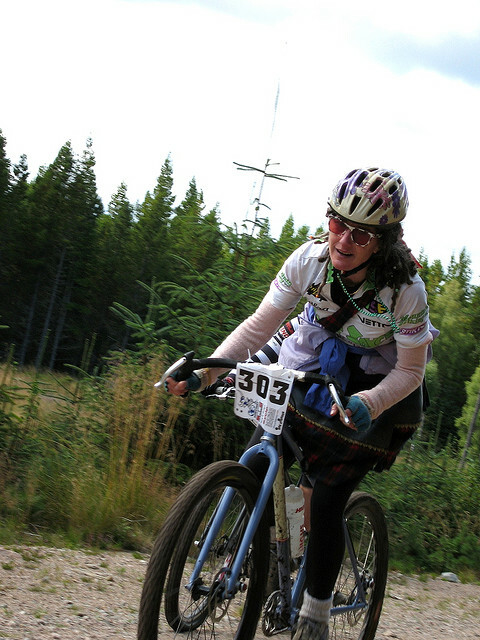 2007 Single Speed World Championship. Photo by Trina Richie via flickr. You’ve had successful career that includes three NORBA titles, racing in Europe, and a whole lot more. What are some of your favorite races, moments, events, adventures? Well, the first NORBA race was on my birthday (Dec 10, 1983). It was a hurried affair, because Glen Odell had just taken control of the small organization that Joe Breeze and his then-girlfriend Barb Eldeston had founded (with myself, Charlie Kelly, Charlie Cunningham, Scot Nicol, and most of all Jack Ingram whose initial idea it was). He wanted to have a race under his belt, in the 1983 calendar year. It was a mudfest and Odell had to curtail the men’s event, to the disgust of the handful of fat tire “pros” (incl. Cunningham racer Steve Cook). They were all piped by a cyclocrosser, Steve Tilford on a course shortened from five laps to three. We women (all three of us) agreed ahead of time NOT to do the three laps we’d been planning on racing (it was a foregone conclusion I’d win, barring an aneurysm), and happily rode 2 rain soaked laps, with the 38 yr old mother of three (Casey Patterson) beating a girl more than 15 years younger (Carmen Carrouche). I won, and Casey brought me home to Topanga Canyon as “her prize.” We hung out for a week because I’d grown up in the San Fernando Valley, and sort of wanted to see what had become of the Valley since I left in 1973. What projects, rides, work, races occupy your time these days? As for the modern stuff…well, I am lucky to get invited to things here and there, now and then. This coming year it will be to Gnomefest and Chequamegon Fat Tire Festival, my first time to that! This entry was posted in Advocacy, Bike Industry, History, Interviews, Mountain Biking and tagged 1980s mountain biking, charlie cunningham, jacquie phelan, mountain bike history, mt. tam, NORBA history, WOMBATS, women and cycling, women mountain biking. Bookmark the permalink. Jacquie! From all of the MTB ladies I thank you.